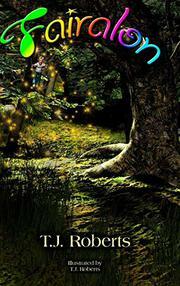 An effervescent middle-grade fantasy story about accepting oneself and others. Eleven-year-old Iris has been through a lot. Her mother died when she was 6, which is when her “behaviors” began; she has a compulsive need to repeat actions three times, particularly when she’s stressed out, and the kids at school are merciless about it. Therapy and medication help her compulsion, but nothing stops her from apparently seeing things that aren’t there. When she sees a boy on a swing disappear into thin air, she wonders whether she’s losing her mind—or if the old swing could really be a portal to another world. Roberts’ debut novel adeptly conveys the language, frustrations, and spirit of a preteen girl with sensitivity and humor. However, the story builds slowly, particularly in its first part, which tends toward too much foreshadowing and explanation. After Iris enters Fairalon, almost halfway through the book, the adventure gets underway with Wonderland-worthy characters, including ninja fairies, Bebb the Butterfly Boy, and riddle-obsessed mountains. These creatures pass along subtle messages about self-acceptance: “You are normal for you; you are just different from the others.” Roberts emphasizes empathy by making “bad” characters behave sympathetically, and having “good” ones be tempted by the lure of power. However, many inner monologues are unnecessary and slow down the plot. Clunky illustrations also distract from the vibrant prose descriptions and occasionally spoil surprises. By the final chapters, however, everything clicks in a page-turning climax. Interestingly, Iris’ coping mechanisms don’t magically disappear during or after her adventures; instead, she gains an appreciation for her strengths and her flaws, and her new friends accept her for who she is, purple hair and all—with the book’s conclusion giving hints of a sequel. An often satisfying novel for young readers that hits most of the right notes.